Robert Quinn speaks to the Executive Council about his nomination to become Commissioner of Safety. 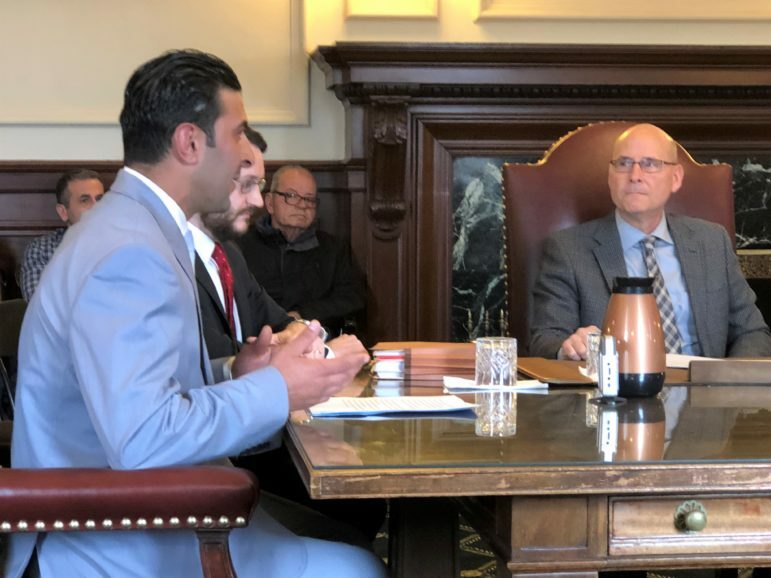 CONCORD — The Executive Council held a pardon hearing for a Lebanese immigrant facing imminent deportation followed by a confirmation hearing for the governor’s choice for Commissioner of the Department of Safety. Both matters were taken under advisement on Wednesday with no votes taken. Robert L. Quinn of Seabrook, currently assistant safety commissioner, has 34 years of public service. 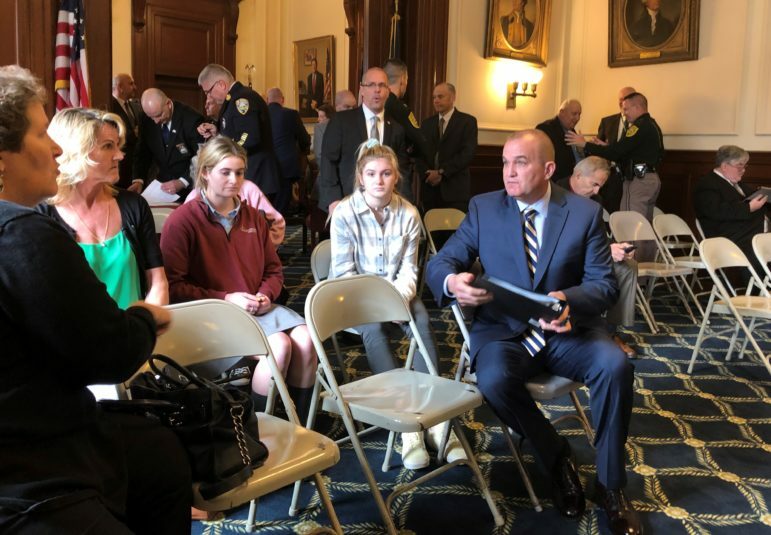 Quinn rose through the ranks from narcotics investigations to head state police and is being tapped to succeed John Barthelmes. No one signed up to speak in opposition to the nomination. Quinn said he was honored and humbled to be nominated. Throughout his many years with the state he has worked to “treat people as I would like to be treated,” Quinn said. From 2016 to today, he has been managing the daily operations of seven divisions employing over 1,500 in the department. He is overseer of the bureau of hearings, prosecution and legal units and has been overseeing Granite Shield and the Office of Highway Safety. Quinn said he would make sure that communication is clear, open and effective. He said the fundamental challenge at Safety is “unknown threats” from cyber-crime and the opioid crisis. He said Barthelmes’ “contributions to this state are incalculable. The state is a better and safer place,” because of his leadership. District 1 Executive Councilor Michael Cryans said he drove up to Troop F in Twin Mountain recently and talked to people about Quinn. Cryans said he was pleased to hear that he cares for all safety employees, regardless of rank and station. District 2 Councilor Andru Volinsky asked about mental health issues and mental wellness for safety staff. “We are having conversations ongoing so that we have adequate resources for all,” Quinn said. He said he would work to develop “a healthy culture” for all. District 4 Executive Councilor Ted Gatsas, formerly the mayor of Manchester, said it was an “honor” to have Quinn as the nominee. “You were always there for us. I know you will continue doing that,” Gatsas said. District 3 Councilor Russell Prescott asked Quinn if he was prepared. “You have to understand what the law is, apply it fairly, and have a good support team…I won’t have all the answers, sir, but I have my work cut out for me,” Quinn said. Attorney General Gordon MacDonald said he did not know Quinn before he was appointed. Deputy Attorney General Jane Young said she has worked with Quinn for 30 years. “He is the epitome of dedication,” Young said. In March, the Executive Council took the rare step of voting 3-2 to grant a pardon hearing for Alain T. Ata, 34. Ata owns Ataboys Auto Services LLC in Manchester and is facing deportation because he is a convicted felon. He is in imminent peril of being deported, said his attorney Tim Ayer. Ata sought the pardon because he wants to remain in the country and work to help support his elderly parents and continue his life with his fiancee. Ata was convicted in 2005 in Rockingham County Superior Court of burglary, conspiracy to commit burglary and two counts of receiving stolen property as a result of a forced break-in at a Salem home the year before. Ata was sentenced to two-and-a-half to five years in prison and served over two years before he was paroled. In a November 2018 statement to support his pardon, Ata wrote that on Dec. 9, 2004, he was driving with a friend who decided to break into to a house. “I tried convincing him not to but his mind had already been made up. When we arrived at the house he kicked the door in and walked in. One of the items he stole was a TV. When we arrived at his house he said, ‘you can keep the TV.’ After a few days, he was arrested on multiple burglary charges and confessed to giving away some stolen property and mentioned my name…I pleaded guilty to all charges. I should have known better than to associate myself with this person and I’m ever since remorseful for this action,” Ata wrote. Alain T. Ata speaks at the public hearing on his pardon request on Wednesday. In his petition, Ata says he made a mistake and did not act wisely when he was young. Ata, his siblings, and his parents left war-torn Lebanon in the mid-1980s. The other members of his family have become United States citizens, but he has not due to his conviction. 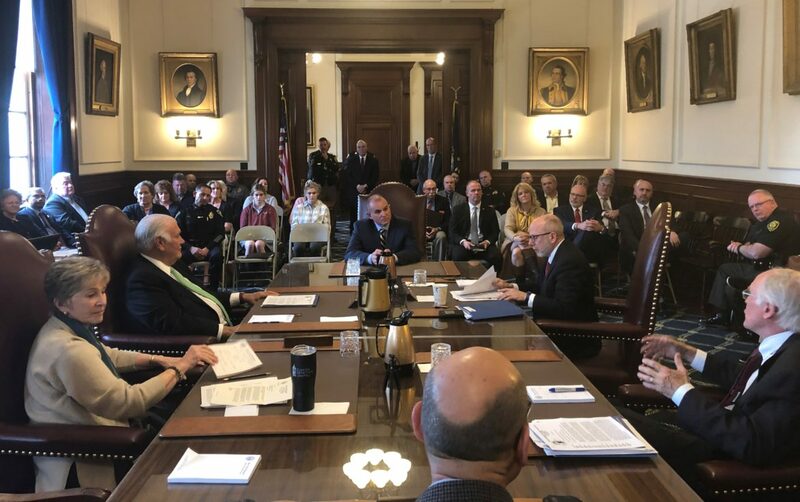 Rockingham County Attorney Patricia Conway recommended against a pardon, saying Ata had additional criminal charges since his 2005 conviction, including two charges of threatening, a conviction for drunk driving with serious bodily injury, and a violation of an abuse prevention order. Ata’s sister, Della Khoury, said the pardon hearing is really “a case of life and death,” contending that refusing this “amounts to a death sentence” if he is returned to Lebanon. Khoury said he paid for his mistakes. Asked why he waited until now to request a pardon, Ata said that the current Trump administration has put a great deal of emphasis on deporting people like him. Ata wrote that when he was a baby, his home in Saida was destroyed and the family moved from shelter to shelter and lived in upheaval until moving to the United States. “This pardon is the only way to lift this burden off my shoulders and allow me to make decisions going forward without the fear of being torn away from all that I love and cherish in this world,” Ata wrote. Gov. Sununu thanked all for their testimony and concluded the hearing without a decision.